When the last of the loaves were cooled and packed away, when the floors were mopped, the tables wiped down, the dishes cleared from the rack, I biked home. I was tired, footsore, worrying about the work still undone and the weekend’s weather report. To the east clouds crowded against the foothills. To the west the sky opened. The light was low and warm, setting the firs and the bare branches of the maples aglow against the rain-dark sky. Colors swelled around me, pulling my out of my head and into the world: grape hyacinth blue as the cloak on a Renaissance Madonna, the exuberant green of unfolding leaves, silver bark, the cream white of a wildly blooming magnolia, the crows on the power line so black they could have been cut from the sky. There is a time late in the day that painters and photographers call the Golden Hour, when the colors are so true they feel like “some tragic falling off from a first world of undivided light.” If I could go out walking every morning and evening to catch that perfect light I would, but I’d settle for watching the day change through big windows. I haven’t yet found any promising spaces for a bakery, and the dearth of options is a sliver of panic through my daydreams and plans. Keep an eye out for me, will you? Big windows, a walkable neighborhood, three phase, gas, and venting, room to grow, a good landlord: all of those would be nice, but I’d make due with one or two. ​After last weekend’s warm sunshine today’s weather is looking decidedly unfavorable, but come down to the first farmers market of the season to say hello anyway. 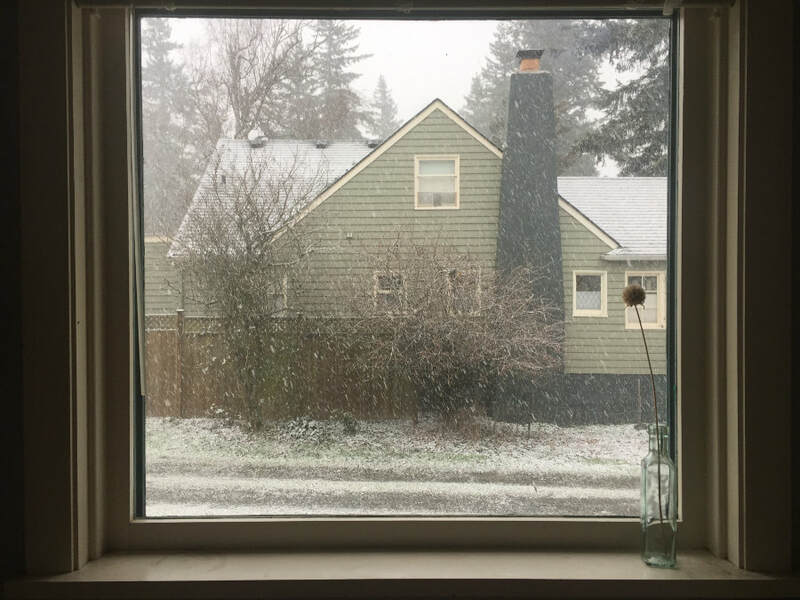 It’s spring in the Pacific Northwest, after all. Rain is to be expected. Sign up through the end of May or order a single loaf. I meant to keep writing during my winter bakery tour. I did write, some—notes, recipes, lists—I just didn't write with the focus or direction to send out the weekly newsletter. Time moves differently without the routines of work and home to mark its passage. A day of travel can hold a week’s worth of noticing, the way a moment of surprise or danger can jerk you out of the half-sleep of habit and into full, startling wakefulness. And yet, even as time stretched to accommodate the density of sensations—new landscapes, new smells, new foods, new conversations and ideas—I found myelf unmoored from the calendar. Saturdays came and went, unnoticed. My laptop, a clunky old Toshiba that no longer holds a charge, sat unopened at the bottom of my bag. I set out on this trip in search of inspiration and ideas and found them. I visited bakers happy with the freedom and efficiency of their cottage businesses, and others grateful for the impact their bustling, 24-hour operations allowed them as employers, producers, and buyers. I met bakers who worked through the night to deliver product hot from the oven, and others who never woke before five, choosing to sell bread the next day for the sake of their sanity and sleep. I visited wholesale bakeries, market bakeries, retail bakeries, and bakeries that combined all three. I met bakers who milled their own flour and others who purchased from nearby farmer-millers or from a regional mill, bakers with wood-fired ovens and others working with huge, gas deck ovens, radical, whole-grain evangelizers and practical businesswomen who appreciated the approachability and ease of white flour. Sometimes I stayed out of the way, watching and sidestepping workers, sometimes I was right in the thick of production, revising recipes, mixing, shaping, and loading the oven. I ate so much bread and butter I had to let out my belt. Home again after visiting so many diverse baking businesses, I find that though I’m still thoroughly daunted by the prospect of building a retail bakery, I'm feeling more resigned to my ignorance than paralyzed by it. What I don’t yet know—and my unknowing is vast and deep—I can learn. Hopefully. The Spring Bread Subscription starts next Wednesday and runs through the end of May. The Baker’s Choice is made up of breads I tasted or talked about on this bakery tour, from dense, seedy ryes to a tender, wholemeal brioche. Sign up for the whole nine weeks, or just order bread (at a slightly higher price) one week at a time. 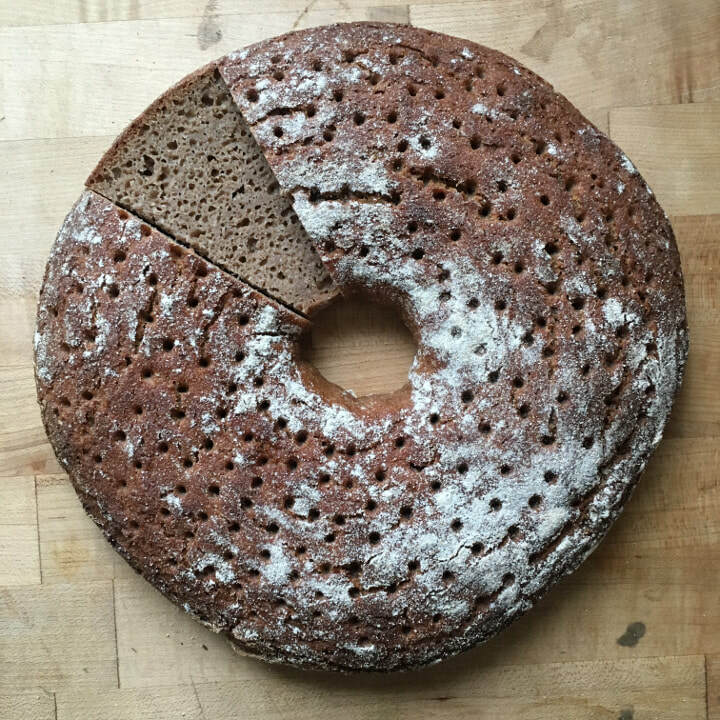 For those who are curious about rye baking and science, I’ve posted the first in what I hope will be an ongoing series of Up Rye Zines on the website (free) and in the webstore ($5.50). 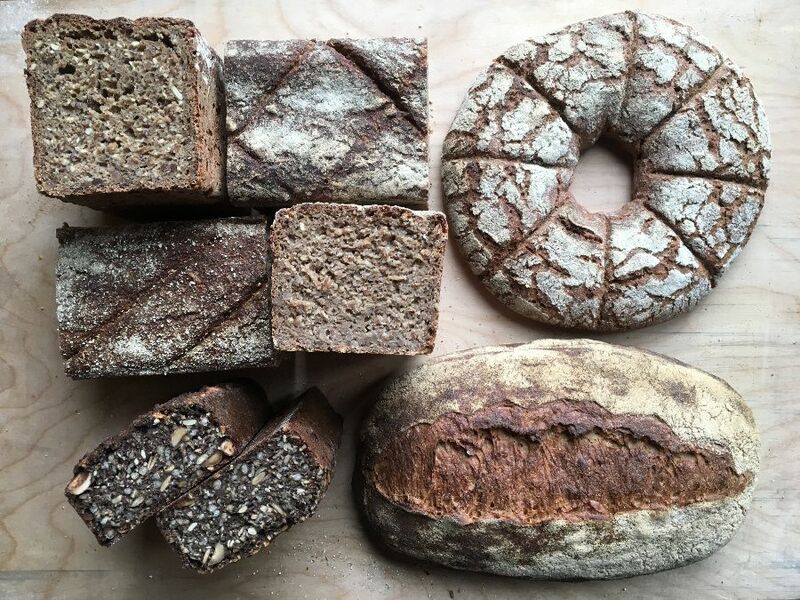 It’s a thoroughly nerdy project that I’m very excited about, and not only because researching rye bread makes for an excellent distraction from financial projections, loan applications, and hunting for commercial real estate. The market season starts up again next weekend! Hopefully we'll have a Saturday as glorious as this one, but I’ll be there, rain or shine, with a full lineup of breads and pastries. This is the last week of the winter bread subscription. I’m taking off for the remainder of March to visit bakeries! The spring bread subscription starts April 3, the Wednesday before the first farmers market, and runs for 9 weeks, through the end of May. Sign up HERE to get your midweek bread. The Baker’s Choice Subscription will be make up of recipes I gather on my travels. ​In the meantime, for those of you who like to bake, or who are interested in starting, I’ve written out a basic recipe for Mountain Rye below so you can keep eating good bread while I’m gone. Bread isn’t hard to make. Mix flour, water, salt, and leavening, give it some time, add heat, and you have a loaf. The challenge is making good bread, consistently. 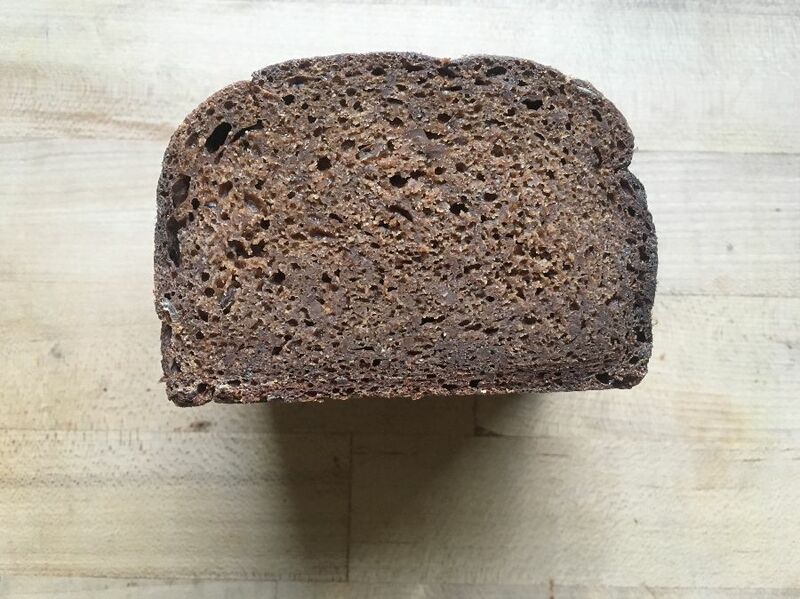 This week's Baker's Choice: a malty, sweet, slow baked black bread, inspired by Åland black bread. 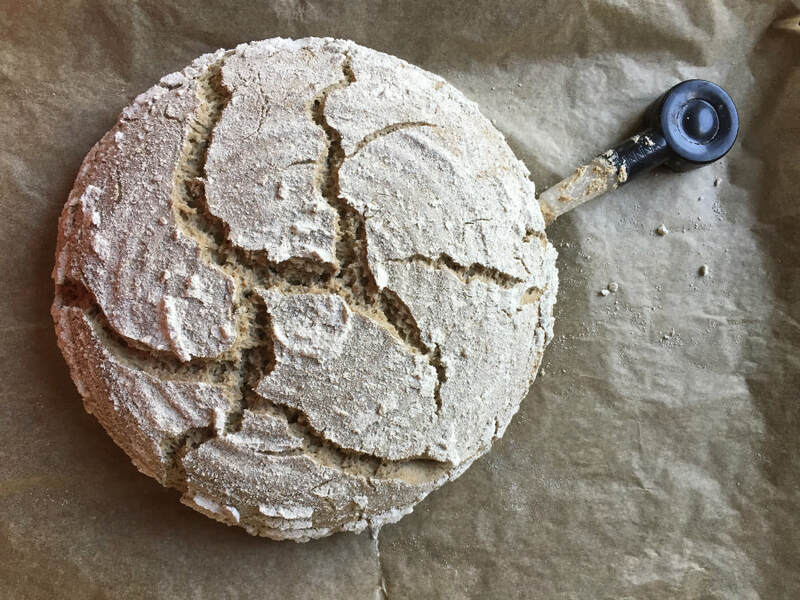 What you’ll need: Healthy sourdough, whole rye & whole wheat flour (available in the bulk section at the Coop), non-iodized salt, a scale, mixing bowls, a loaf pan, an oven, the contents of your pantry. Optional: A thermometer. Sourdough: Mix 145g warm water, 145g whole rye flour, and a generous teaspoon (7g) sourdough. Cover and leave in a warm place overnight (12-14 hours), until the dough has risen and is just starting to collapse. Soaker: Mix 155g total of the seeds, cracked/rolled grains, toasted old bread, nuts, dried fruit, or whatever other dry goods you have in your pantry that look interesting. Add 2 teaspoon (11g) salt. Optional: add 1 teaspoon (5g) whole spices, toasted and ground (caraway, coriander, anise, and fennel are common bread spices, but you can use anything you want). Pour 225g boiling water over the top and let the soaker sit for a few hours or overnight. Dough: Mix the sourdough and the soaker until smooth, breaking up any clumps of seeds or old bread. Add 170g whole wheat flour, 60g whole rye flour, and 90g very warm water. Mix vigorously until the dough is smooth and supple (5-10 minute). It will not feel strong like a wheat dough. Set aside, covered, in a warm spot for half an hour. Turn the dough out onto a lightly floured surface and press into a long rectangle with floured hands. Roll the rectangle up and set seam side down into the greased bread pan. (Add more flour as needed to keep the dough from sticking to your hands or the counter, but try not to roll raw flour inside the loaf). Press the rolled dough into the pan. Score the top by cutting a 1/4” deep crosshatch (a flat-ended spatula works well) or by poking holes with the narrow end of a chopstick. Cover and let rise in a warm place until the dough has expanded by about half and the surface of the loaf shows widening cracks (2-5 hours). Preheat the oven as hot as it will go. Add a pan for steam. When you load the bread into the oven, pour a cup of hot water into the steam pan. Bake for 10 minutes at the hottest temperature, then lower the oven to 375F and bake for another 50-70 minutes. The loaf is done when a thermometer inserted into the bottom reads 198F to 205F. If you don’t have a thermometer, err on the side of caution. 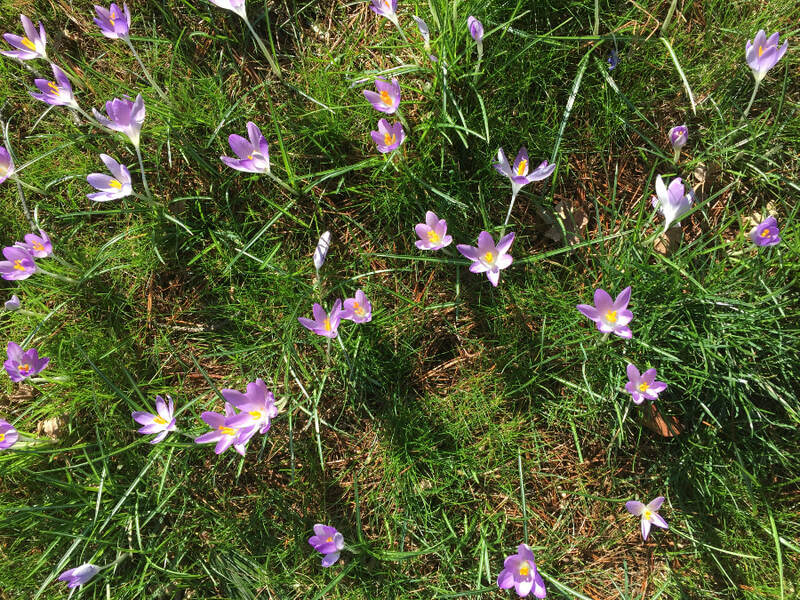 Late February already, and the crocuses push up through the moss and grass, violet and yellow against the brightening green. The birds are all out at once: robins probing the lawn, warblers gossiping in the hedgerows, mallards and mergansers crowding the water, and in the stubbled fields flocks of swans browse, their necks bent like white question marks to the untilled earth. Skiing last weekend over Lightening Lake I squinted into the cold, trying to read the shape of the land in the flat light. The snow was depthless, the hills on either side dark and close, the sky low. The landscape felt too austere for beauty after the noise and exuberance of our temperate spring. But when the sky opened on a patch of western blue and the low sun lit the clouds’ heavy bellies warm gold, lit the hills and lake, lit my face and chest and the cold fronts of my thighs, I stood still, caught by the light. I won’t always write about walking. As summer approaches the work begins to tighten around my days, squeezing out the spare hours till moving through the world becomes purely functional: cycling for transportation, running for exercise, driving for hauling impossible loads or covering impossible distances. Then I’ll write about baking, or cycling, or perhaps running. But now, in the slow heart of winter, I have time to walk. The time I take to walk without direction is often the truest part of my day. The chores and routine work, the hours absorbed by the blue glow of my screens, the casual interactions with friends and strangers, these so easily blur till the days slip by into unremembered months. Perhaps what I find in walking is the sort of moving meditation others seek in yoga or martial arts. Walking brings time into focus, makes me fully embodied and awake to my surroundings. Already, most of the hours I spent indoors yesterday are slipping from my memory, but I remember so well the yellow of the willow branches and the clean cut of snow against wet pebbles at the high tide line. I remember the cold of the wind and the heat of my body. I remember the sound of wings, and looking up to see crows silhouetted against the white blue sky, flying north. ​We walked out of the forest and down the lee side of the spit. 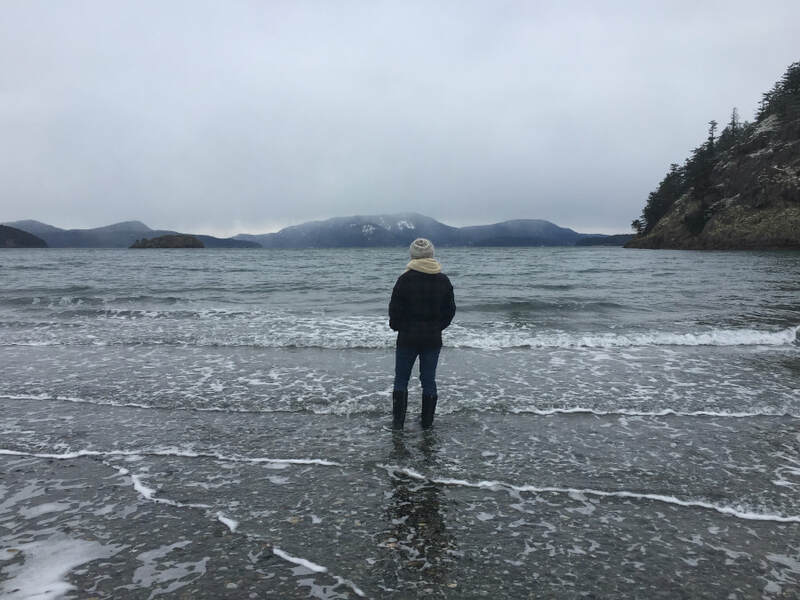 The water was the same dense gray as the sky, the islands dark and snow dusted, disappearing into fog where sky and water merged. Two skiffs out in the bay passed close enough for conversation, but from shore we could hear nothing but the wind and gulls. The beach’s contours had changed since the last time I’d walked this way at low tide. The point, when we reached it, was flat and broad where before had been a sharp, current-rippled ridge of sand and pebble. Out of the land’s shelter the wind took us hard. I balled my hands into fists in my pockets as I looked out over the channel, the water an eerie, pale green and frothing white. Birds flocked this shore, the gulls swooping up to drop shells onto the rocks, the ducks crowding the sandy flats, facing into the surf. They lifted up before us, resettling as soon as we’d passed. The wind was picking up, cutting cold through my heavy coat and hat, icing my fingers, stiffening my face. The waves had thrown up new driftwood above the tide line and scattered shells that showed secret purple and mother of pearl green against the dark sand. Down the beach, something large and white stood at the edge of the driftwood. We followed the footsteps of other curious walkers to investigate. The shape sharpened into a padlocked sail chest, a single tie line hanging down its side. In the summer the beach is littered with plastic, but the winter empties the sea of casual boaters and their trash. The chest was the was the only jetsam we found on that whole wild shore. Back at the forest’s edge we turned away from the wind and towards an unexpected piece of abstract art: the wind had painted snow into icy, white racing stripes up the windward side of each exposed tree. Glancing back, I found the forest behind us was dark. Before us, the bold white stripes shone and swayed. A few paces into the trees and the quiet closed around us. The air was still. I took my hands out of my pockets and flexed my fingers. High above, the treetops twisted, shaking down snow flurries. Above the trees, a raven played the storm, wing dipping and rolling, skimming the air, before swinging around in a broad arc to ride down the wind and out of sight. Baker's Choice: Tinned Rye with Raisins & Walnuts - inspired by the rugbrod so many of you loved a few weeks back. 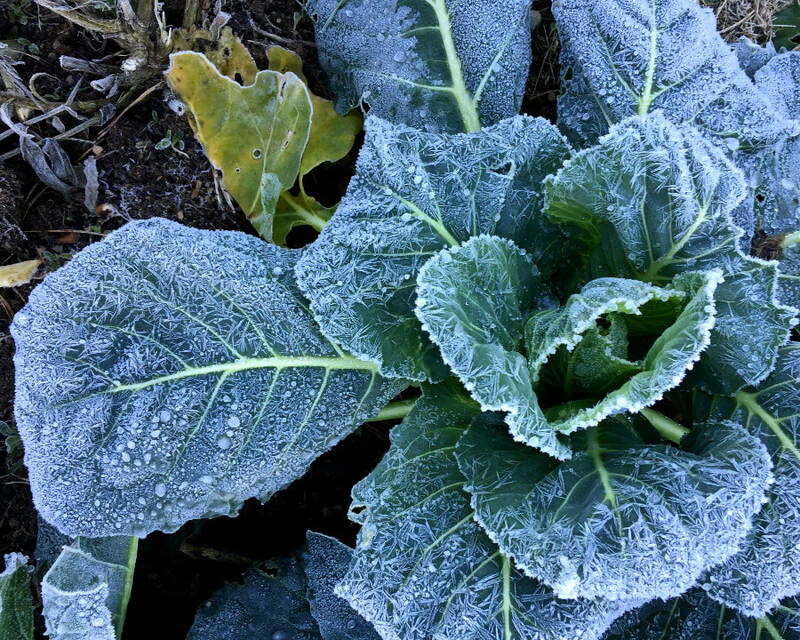 100% Whatcom grown (except for the salt). Happy Valentines! Tracking fermentation (with a nifty little Bluetooth pH meter) in a test batch of Farmer Bread. 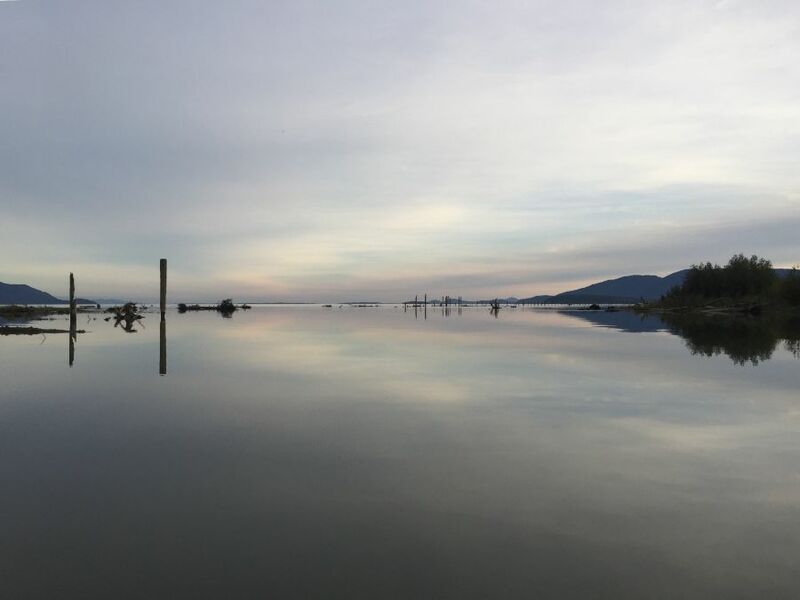 I spent last weekend in Olympia at the Cascadia Grains conference, talking with farmers and bakers and listening to talks on subjects ranging from business finance to climate change, crop rotations, and the centers of origin for the world’s grains. I came home, as I always do from these industry events, fizzy with anticipation and nerves, invigorated by the in person connections in a way I never am by interactions on social media. I want to build this bakery dream into reality. I want so much more than this little market business can hold. I’ve been deep in the numbers all week, building foolishly complicated spreadsheets, researching costs, working out financial projections. Next up: financing, real estate, incorporation, interviewing contractors and designers and accountants and attorneys. When I think about all the steps between here and my cheerful, light-filled bakery, I want to climb back into the dough tub (metaphorically) and just hang out with the bread. Bread is so wonderfully complex, but also simple, you know? Tangible. Immediate and satisfying in a way the business planning is not. To fight the paralyzing size of this new project, I make task lists. Lots of them. In notebooks, in spreadsheets, on loose scraps of paper. I make task lists for making more task lists. That way, I have one step to take, and then the next. And when the nerves overwhelm the anticipation, I have the stories I’ve written to myself about the bakery. Dozens of little stories, each a window into the dream bakery, to remind me that at the end of the lists is a business as tangible and immediate as the bread it will produce. But bigger. And not at all simple. Baker's Choice: Farmer's Bread 1.0 - a crusty rye & wheat boule, inspired by the Austrian Bauernlaib. Eventually, I'd like to add a rye boule like this to my weekly bread lineup. Help me develop the recipe by letting me know what you think of the sour balance (lactic/acetic), the spice mix and strength (currently a little fennel, caraway, and blue fenugreek), the texture (moisture, density), the keeping quality, and anything else you think is important in your daily bread.